TORNIELLO - Situs partium praecipuarum totius terrarum. TORNIELLO, A - Situs partium praecipuarum totius terrarum. Title : Situs partium praecipuarum totius terrarum.. Date : Holland, ca. 1620. Size : 7.3 x 14.4 inches. / 18.5 x 36.7 cm. 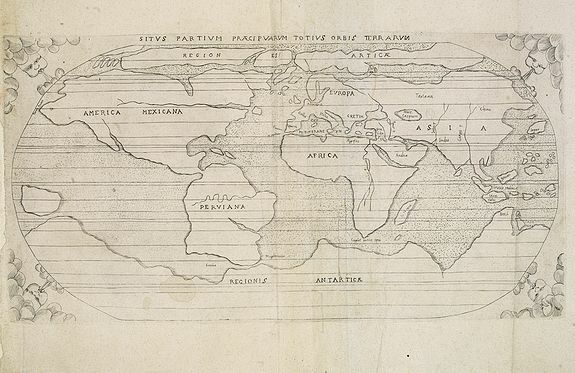 Description :Unusual and delicately engraved world map on an oval projection. This is based on Ortelius' world map of 1570, but is much simplified with very few place names. In the Arctic there are both Northeast and Northwest Passages. North America bears the name of America Mexicana with an unnamed St. Lawrence River stretching far across the continent and no Great Lakes. South America is named Perviana and is shown in the bulbous, potato shape that Ortelius used for his earliest versions of the continent. An unnamed Amazon reaches far across South America, nearly reaching the opposite coast. A massive Regionis Antarctica extends across the southern portion of the world, with only the place name of Beach noted on a portion of what would become Australia, in reference to Marco Polo's writings of his explorations. In Africa, the Nile originates in the southern tip of the continent, but without the Ptolemaic twin lake source. The map is decorated with wind head spandrels in each corner. Condition : Left margin cut till neat line, with extended margin. Paper slightly browned and marginal water staining.